President Islamic Republic of Pakistan, Chancellor Institute of Space Technology, Mr. Mamnoon Hussain and Vice Chancellor IST Engr. Imran Rahman with the participants of ICASE 2017 at Institute of Space Technology in Islamabad. A spectrum of 50 national and international invited speakers from sixteen countries are attending the prestigious International Conference on Aerospace Science & Engineering (ICASE 2017) at Institute of Space Technology (IST) in Islamabad. The speakers from Canada, USA, UK, Spain, Germany, Italy, Sudan, Egypt, Turkey, UAE, China, Sri Lanka, Hong Kong, Malaysia, Philippines, and Australia will share their research accomplishments with the academicians, researchers and students. The fifth ICASE 2-17 conference will continue from November 14-16, 2017 at IST. German Astronaut Dr. Gerhard Thiele, Head ESA’s Human Spaceflight and Operations Strategic Planning and Outreach office Germany, Dr. Alim Rüstem Aslan of Istanbul Technical University (ITU), Turkey and Dr. Ahmed El-Mowafy Curtin University from Australia were the worthy keynote speakers of the first plenary session. 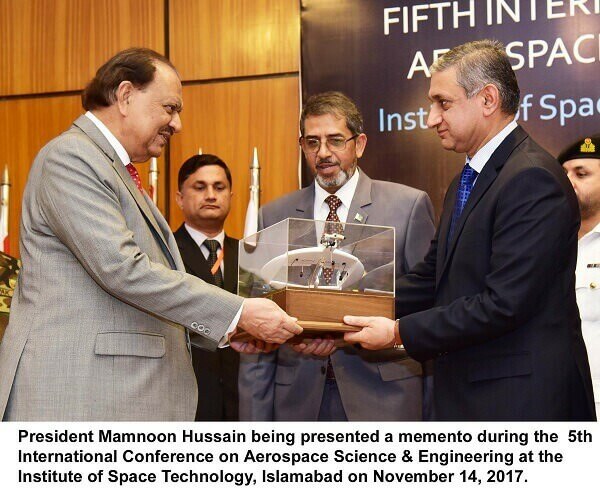 President of the Islamic Republic of Pakistan, Chancellor Institute of Space Technology, Mr. Mamnoon Hussain inaugurated the ICASE 2017 and graced the occasion as Chief Guest. Senior dignitaries from the academia, elite R&D organizations and industry were also present on the occasion. Addressing the speakers and students, the president said that scientists had taken mankind into space and into virtual life through cyber technology, adding that the list of human conquests was getting ever lengthier with the unraveling of the universe’s mysteries. The President expressed his deep appreciation for the efforts being made by IST towards achieving academic excellence and promoting research focused on space technology in particular, and on associated technologies in general. He said that it is heartening that IST enjoys active and healthy liaison with the world’s leading space exploration institutions. The president emphasized that institutions like IST and SUPARCO should broaden the scope of their research projects and endeavour to find answers to new questions arising in different sectors. Vice Chancellor IST Engr. Imran Rahman while highlighting the many achievements of the Institute in a very short time stressed the importance of space science & engineering education & research, as it will be a major contributory factor for advancement in all technologies. He said, the government has to provide ample resources & funding, which in turn will have a major beneficial financial impact on our economy. A total of 100 research papers will be presented at the conference while 25 poster presentations will be held. There will be 26 technical sessions during the conference covering the different themes and tracks related to aerospace science and engineering. In addition to that, there will be 3 plenary sessions, 7 panel discussions, and 20 tutorials and workshops sessions in connection with conference themes. The conference started off with the plenary session 1 including distinguished international speakers followed by different technical sessions. Dr. Najam Abbas, Secretary of the conference, hosted the plenary session. The Vice-Chancellor IST and Chairman of the Conference Engineer Imran Rahman chaired the plenary session.